Enjoy a full breakfast buffet for a good start ! 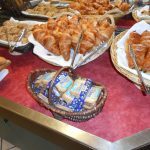 The breakfast buffet is served every day at the restaurant from 06:30 am to 10:00 am. A full buffet will provide you with the energy and nutrients required to be in great shape all day long.